Tuesday February 25th 1879 I cleaned up the house this morning and nearly made a bonnet for May. I finished it in the afternoon and did some sewing. Mother and Father were invited over to Fletchers to supper. About four oclock it began to snow and blow and I never saw a worse night The folks got home about nine oclock. I had a letter from Hatt today and wrote to her in the evening. 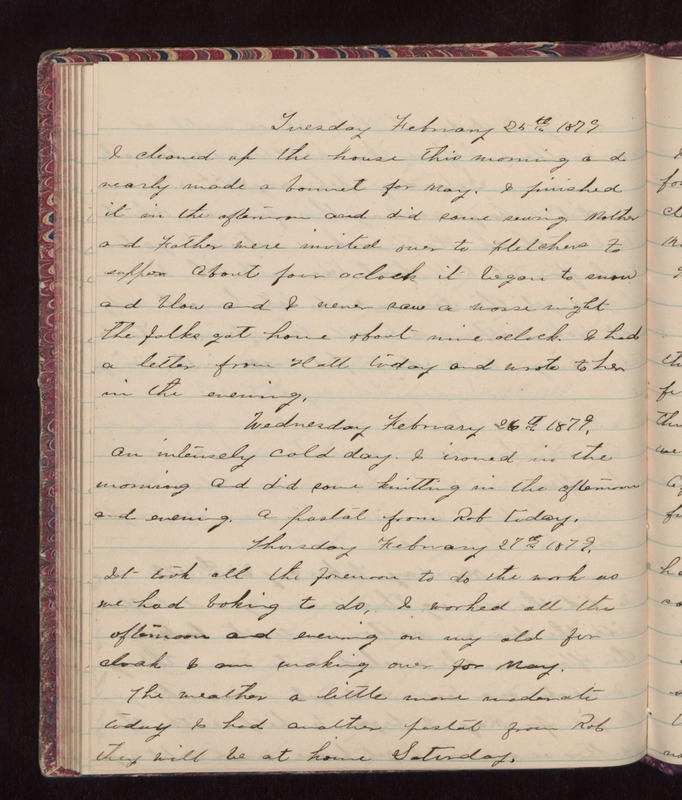 Wednesday February 26th 1879. An intensely cold day. I ironed in the morning and did some knitting in the afternoon and evening. A postal from Rob today. Thursday February 27th 1879. It took all the forenoon to do the work as we had baking to do. I worked all this afternoon and evening on my old fur cloak I am making over for May. The weather a little more moderate today I had another postal from Rob They will be at home Saturday.